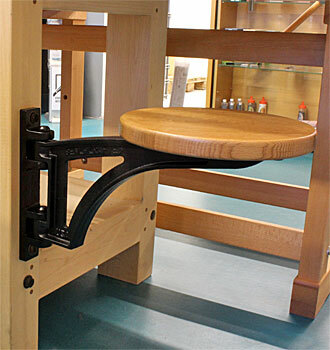 The Benchcrafted Swing Away Seat is the solution for seated work at the bench. Chopping waste between dovetails, making decorative inlay and other close work is best done from a steady, seated position. The work is brought closer to your eyes and chest, which helps you to work more precisely and comfortably. It's also a great spot to take a break, check email, or have lunch. 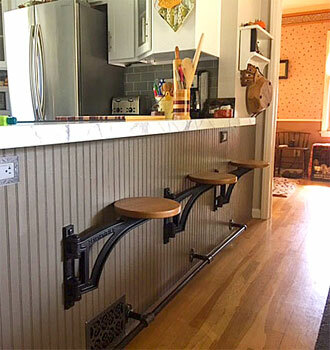 Stand-alone stools can be cumbersome in your bench area, often getting in your way when you stand up to check your work. Having a stool underfoot can be a tripping hazard or just plain annoying. The Swing Away Seat is always at the ready, just swing it into position and have a seat. When you're through with it, simply stand up, bump the seat with your leg and it swings under your bench, out of the way. 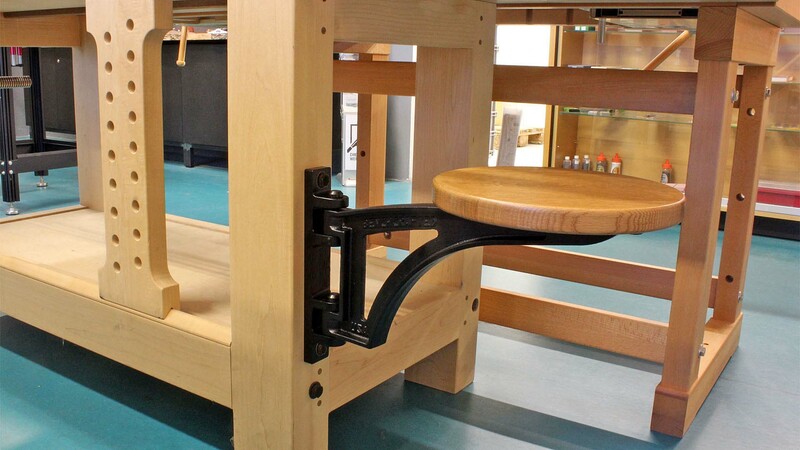 The Swing Away Seat is not only useful in a workshop setting, but also in the kitchen, dining area, bar or restaurant, where you can easily clean under the seat since its not attached to the floor. The height of the seat is not adjustable once mounted. Mounting the seat is easy with two 12 mm diameter lag screws or 12 mm diameter machine bolts and nuts, depending on your mounting surface (mounting hardware not included, but is easily sourced at your local hardware store.) For more technical info on mounting the seat, download the Swing Away Seat instructions below. 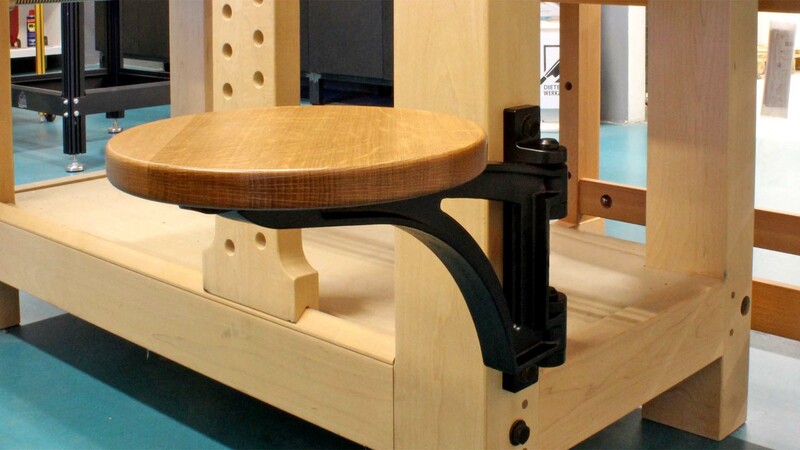 Like the Benchcrafted vices, the Swing Away seat is overbuilt. 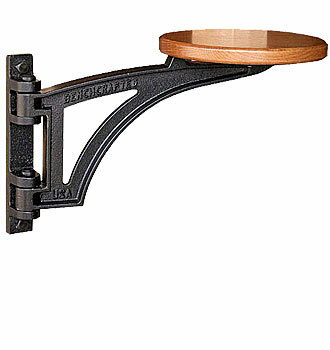 The iron components have no practical weight limit as regards the human body. In other words, it will support any human large or small. But since the seat is cantilevered off its mounting surface, one does have to be mindful of the mounting structure. A free-standing structure could be prone to tipping, depending on the shape and weight of the structure, the weight of the sitter and the activity. See the installation document for further details. The Swing Away seat will pivot a bit over 180 degrees. 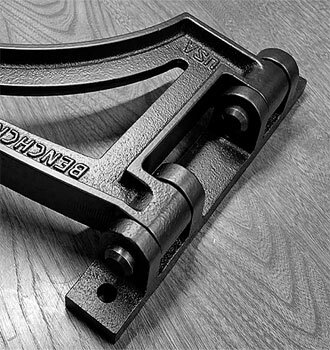 The mount and bracket are cast in gray iron and powder coated in a satin black finish. The pivot pins that join the mount to the bracket are steel with a black oxide finish. The Swing Away Seat is offered two ways. If you are a woodworker or upholsterer and would like to make your own seat, you can purchase the Swing Away Seat without a wood seat. We also offer the Swing Away with a 25 mm thick, 279 mm diameter wood seat, finely crafted of quartersawn white oak and finished in chestnut lacquer. Assembly is required. The seat attaches with three wood screws. All you need is a Philips screwdriver to attach the wood seat. 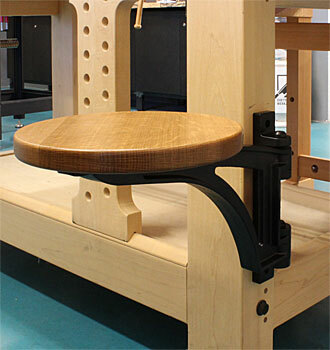 Both versions of the Swing Away Seat include wood screws for attaching the oak seat, or your own wood seat.